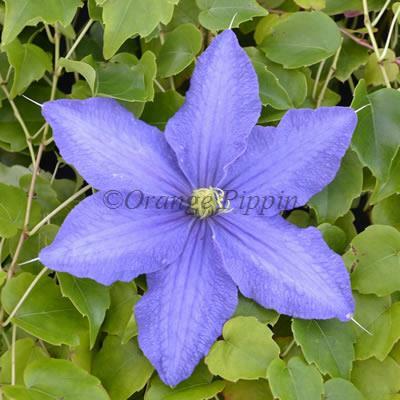 Clematis 'Rhapsody' has the most wonderful, vivid blue flowers, the colour of which deepens further as they age with cream centres from July to August. This free flowering variety is definitely worth a place in the garden, and can happily climb up a trellis, pergola, along a fence or wall, or planted in a container on the patio supported by an obelisk. Clematis 'Rhapsody' is attributed to Frank Watkinson of Doncaster and to Barry Fretwell of Peveril Clematis Nursery, England.